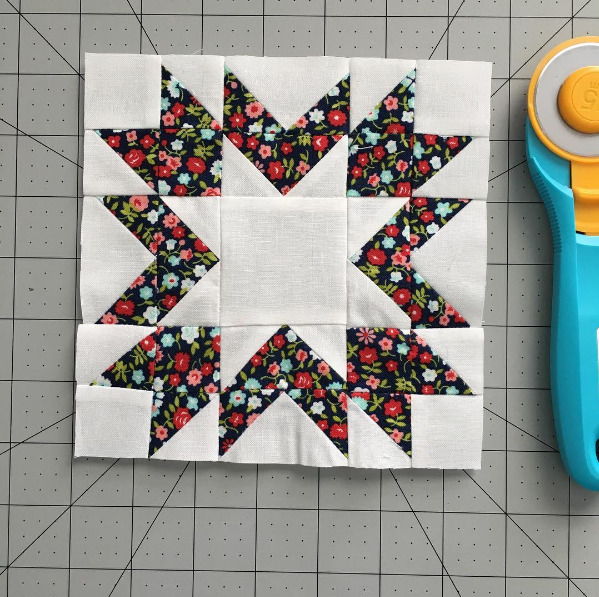 This block can be so fun IF you pick your fabrics correctly. There are those who would remake a block or not post it on their blog to keep up appearances. I firmly believe that we ALL make mistakes and we ALL can do things differently, but that doesn’t mean we should hide these imperfections from the world. I did not choose my values well on this block. 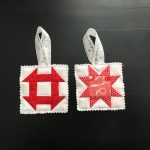 I either needed to pick a darker pinwheel center or change out my hexie fabric. 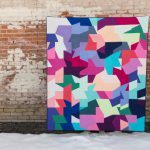 There is not enough contrast in those two fabrics that this block ends up looking rather “meh” to me. 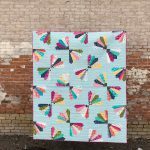 No matter where you are in your quilting journey, you will choose fabrics that look “meh” to you upon completion. THAT’S OK!! You are learning! 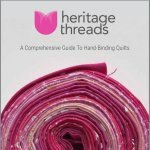 If you expect perfection from yourself, the hobby of quilting becomes a burden. Enjoy the process! 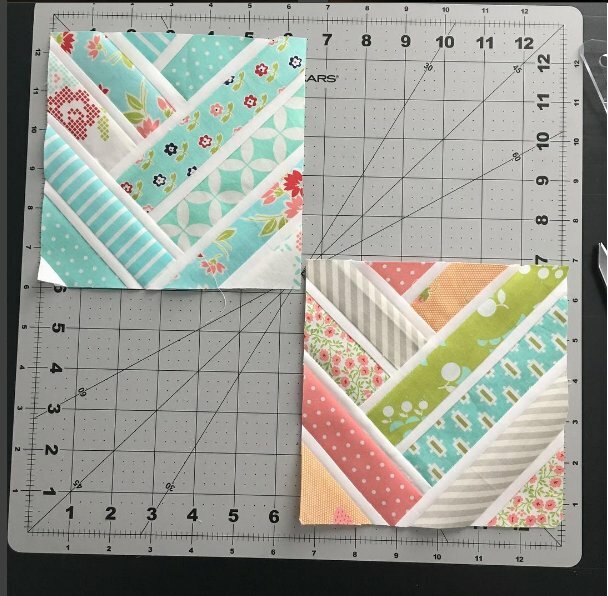 I’m listing cutting instructions based on my color scheme for ease of explanation, but please feel free to make better choices than I did. 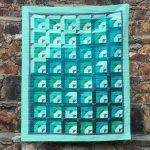 Make 4 flying geese using the teal 2 x 3 1/2″ rectangles and blue 2 x 2″ squares. 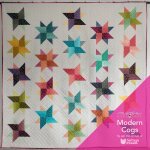 Make 4 half flying geese using the hexie 2 x 3 1/2″ rectangles and white 2 x 2″ squares. 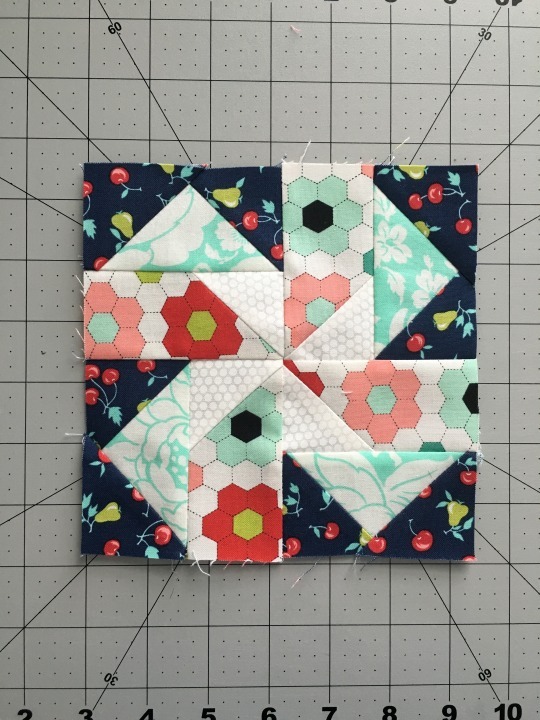 Assemble each piece in quarters, press, then assemble the block together.